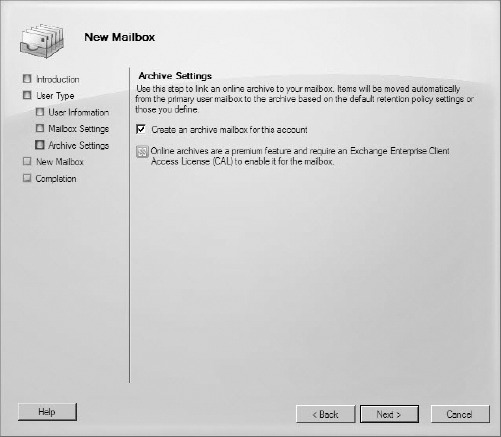 A new feature of Exchange Server 2010 is the ability for users to have online email archives. One of the challenges of Exchange over the years has been controlling the size of user mailboxes. Many users got into the habit of moving email out of their inbox and into personal folders (PST files). When mail is moved to Personal Storage Table (PST) files, it is removed from the mail server and the user regains some of the space allocated for their mail quota. The problem is that PST files reside on user workstations or sometimes even network shares, which makes the email inside the files unmanageable. It's up to the user to back up the PST files, and if a PST gets corrupted, all the data can be lost with no backup to restore from. The online archive in Exchange Server 2010 can replace PST files. Users can drag and drop email from their mailbox or from existing PSTs into their online archive, which has a bigger storage quota than the mailbox. Unlike PST files, the archive is accessible in Outlook Web Access as well as locally in Outlook 2010. Large amounts of data can reside in an archive folder because the archive is only available online. Users do not need to download many gigabytes of data into their Outlook client when working in cached mode with the online archive. You can create an archive for new users up front when you create their mailboxes or you can add the archive to existing mailboxes at any time. Creating the archive mailbox is an easy process and users don't have to do anything to enable it. 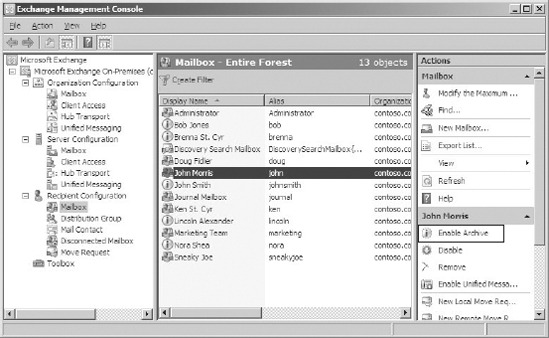 Outlook 2010 determines whether a user has an archive mailbox during the AutoDiscover query. When the archive mailbox is added for a user, it will simply appear in Outlook after a few minutes. The user can close Outlook and reopen it to expedite this process. You can create an archive for a new user when you create the mailbox in the EMC. When you get to the Archive Settings dialog box, select the Create An Archive Mailbox For This Account check box, as shown in Figure 7. Open the EMC and browse to the Recipient Configuration => Mailbox node in the Console tree. From the list of existing mailboxes, select the mailbox that you want to create an archive for. In the Actions pane, click the Enable Archive action, as shown in Figure 8. You may be prompted with an informational dialog box, explaining that you need an Enterprise Client Access License for the archive and asking you if you want to proceed. If you have the required license, click the Yes button and the archive is created. Like primary user mailboxes, archive mailboxes have quotas that apply to them. However, when an archive mailbox reaches its quota, the user's ability to send and receive email is not restricted. There is a warning quota and a hard quota. When an archive reaches the warning quota, an event is logged in the server's Application event log. When the hard quota is reached, items can no longer be placed in the archive. You can modify the warning quota in the EMC or the EMS, but the hard quota must be modified in the EMS. In the Results pane, select the mailbox that you want to adjust the archive quota for. In the Actions pane, click the Properties task under the Action menu of the mailbox that you selected. This displays the properties dialog box for the mailbox. In the properties dialog box, select the Mailbox Settings tab. In the list of mailbox settings, select Archive Quota and click the Properties button above the list. In the Archive Quota dialog box, select the Issue Warning At (MB) check box and enter a size limit in the text field, as shown in Figure 9. Similar to primary mailboxes, archive mailboxes have statistical data that you can gather. This data allows you to see various aspects of the archive, such as the number of items in the archive and the size of the items. Users can pull data out of their mailbox or their PST files and drop it directly into the archive. The archive appears in the user's Outlook view at the same level as a PST file would. This is illustrated in Figure 9.10. Users can simply drag folders or items from the PST file and drop them into a folder in the archive. This is a manual process that is completed by the user. There is no automated way to search out PST files and import them into the archive.